Although Magento 2 is in many ways better than Magento 1, there is still a room for improvement especially when it comes to the backend interface. Today we shed light on one essential feature that is not available in our favorite ecommerce platform by default – custom order statuses. 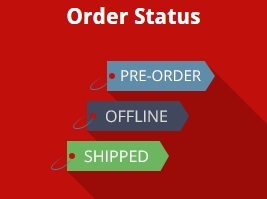 The Magento 2 order status extension significantly simplifies the way you manage orders in the backend section. The Amasty Order Status Magento 2 module not only lets you create eloquent order statuses but also provides the ability to inform customers about every change related to the order status. As a result, you get an additional communication channel with customers, new sorting and filtering options, order status change notifications, as well as the ability to automate your daily routine. Store View Support: assign separate email templates per store view. 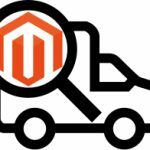 Now, when you know that the Amasty Order Status Magento 2 extension essentially expands the default backend workflow, we should say a few more words about its functionality and usage. The ability to create an unlimited number of custom order statuses helps to adjust the default Magento 2 platform to all possible unique requirements related to orders. You no longer have to think how to use default statuses to make them suitable for your non-trivial workflow: create missing ones and run your backend management much more efficiently. Furthermore, you can substantially improve customer experience by introducing new and more explanatory order statuses. As for notifications, they can be triggered by every new order status change. 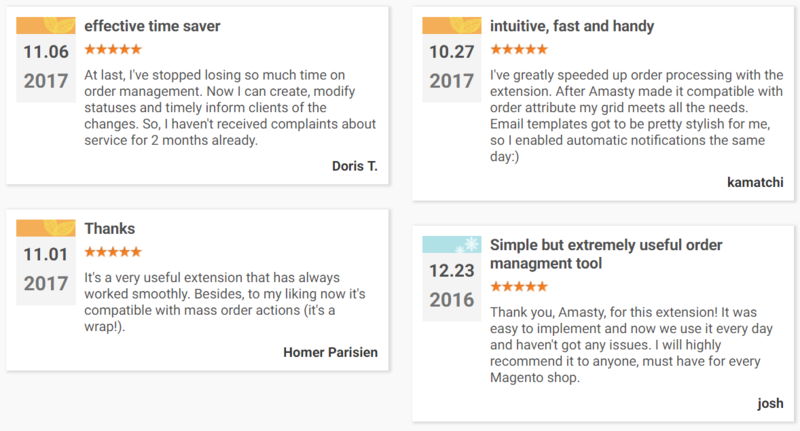 Thus, the Magento 2 order status extension by Amasty allows keeping clients informed and satisfied with the services you provide. In addition to fully automated notifications, you can send manual emails if necessary. As mentioned above, it is possible to assign a new template to each order status, as well as Magento 2 custom order status to default order states. Connecting everything with the help of Amasty Order Status Magento 2 extension, you will get a robust system that rapidly responds to all changes, providing clients with all the necessary information. Also, note that custom order statuses are displayed in both customer account and order grid. How do all these things work in the backend? You will find the answer in the following section. The Amasty Order Status Magento 2 module can be configured under Stores -> Settings -> Configuration -> Amasty Extensions -> Order Status. Here, you can show/hide order state from custom status. Set “No” to display both custom status and associated order state. Now, let’s go to Sales -> Operations -> Order Statuses. The grid with custom order statuses is available here. You can edit them, as well as add new statuses. While editing a Magento 2 custom order status, the Amasty Order Status extension allows an admin to change the status name, select default order states to which to the status will be applied, and enable/disable the status. Besides, you can configure email notifications. The Magento 2 order status module allows enabling/disabling automatic notifications, as well as selecting email templates for each store view. Email templates can be managed under Marketing -> Communications -> Email Templates. To see how the extension works, go to Sales -> Operations -> Orders. In the orders grid, find the Status column – Magento 2 custom order statuses are displayed here. Besides, you can filter out all the necessary orders by a custom status. Click the Filters button, find the Status filter, select the required custom order status from the dropdown list, and click Apply Filters. Now, let’s view an order page. Hit the View link in the Action column. Under the Information tab, find the Order Total section – you can change Magento 2 order status here. Compatibility with Amasty Mass Order Actions was introduced. The module is compatible with Amasty Customer Attributes and Order Attributes for Magento 2. Although the improvements provided by the Amasty Order Status Magento 2 extension are not huge, they are vital for ecommerce sites. A small feature completely changes the backend order management, making it more adaptable and admin-friendly. As for buyers, they also get better services and more user-friendly Magento 2 custom order statuses. The price of the extension is $139, so don’t hesitate to give it a try.